For Aston Martin model cars click HERE. For Audi model cars click HERE. Green, Red & White Stripes on Sides. Green & White Stripes on Hood. White "Castrol" Logos on Sides & Hood. White Square with #7 on Sides & Hood. Red Hot Wheels Logo on Sides, Black Malaysia Base, Chrome WSP wheels. Red & Blue Stripes Graphics, a Small Red Hot Wheels Logo, a #16 & "Castrol" on sides & hood, Black Malaysia Base, Chrome/Black MC5 wheels. Red & Blue Stripe Graphics, Hot Wheels Logo with a #68 & "Castrol" on the Sides & Hood, White Malaysia Base, Chrome/Black MC5 wheels. Detailed headlights & taillights. BMW Roundels on hood & trunk. Black grille. "M4" badge on trunk, Black Malaysia Base, HW J5 wheels. black roof, rear view mirrors left and right, tampo'd headlights & taillights, BMW & M4 emblem rear, BMW emblem front, Black Malaysia Base, Chrome PR5 wheels. Red & Blue stripes on hood & sides, #4 & "bmw-motorsport.com" on sides, Black Malaysia Base, Chrome PR5 wheels. Red, White & Blue on sides & hood, #232 on sides & hood, Black Malaysia Base, Chrome 10-Spoke wheels. Red, Blue & Silver on sides & hood, #232 on sides & hood, Grey Malaysia Base, Chrome 10-Spoke wheels. Black, Blue & White checkerboard on sides & hood, #36 on sides & hood, Black Malaysia Base, Chrome 10-Spoke wheels. Black, Blue & Red checkerboard on sides & hood, #36 on sides & hood, Black Malaysia Base, Chrome 10-Spoke wheels. Light Blue, Blue, Red & Silver BMW "M" logo on sides & roof, #12 on sides & hood, Dark Grey Malaysia Base, ChromeRed/Black PR5 wheels. Grill & Headlight tampos, Grey Malaysia Base, Chrome10-Spoke wheels. Grill & Headlight tampos, Metallic Grey Malaysia Base, Chrome Y5 wheels. Blue & Black stripes on sides, Black stripes on hood & spoiler, Grey Malaysia Base, White/Black PR5 wheels. Black, Red & Blue stripes on sides & hood, Black Malaysia Base, Gold W-Spoke wheels. Blue, Red & Black stripes, #9 on sides & hood, Dark Grey Malaysia Base, Chrome/Black MC5 wheels. White, Blue & Black stripes, #9 on sides & hood, Dark Grey Malaysia Base, Chrome/Black MC5 wheels. Blue & White stripes, Silver HW logo on sides, Grey Malaysia Base, White/Black MC5 wheels. Blue & White stripes, Silver HW logo on sides, Grey Malaysia Base, Chrome MC5 wheels. Black, Silver & Light Blue stripes on sides & hood, Black Malaysia Base, TRAP5 wheels. Black and Silver Stripes, Black Malaysia Base, TRAP5 wheels. tampo'd headlights & taillights, Grey Malaysia Base, J5 wheels. For Bugatti model cars click HERE. light Blue & Silver stripes on sides & across top, White #12 on sides, Chrome Malaysia Base, Chrome 10SP wheels. White & Black tampos, #01 & "Cadillac" on sides, #01 & Cadillac emblem on hood, Black Interior, Black Malaysia Base, Chrome/Grey CM6 wheels. Red, White, & Black tampos, #5 & Cadillac emblem on sides & hood, "Cadillac" emblem on rear wing , Black Interior, Black Malaysia Base, Grey CM6 wheels. For Chevrolet Bel Air model cars click HERE. For Chevrolet Camaro model cars click HERE. For Chevrolet Pickup Trucks model cars click HERE. Red Stripe Graphics on Sides, Hood & Roof. Small White Hot Wheels Logo with "Advan," "GReddy" & "Yokohama" logos on doors. White square on hood with small red Hot Wheels logo & black "96." White "Advan" logo on hood, Grey Malaysia Base, ChromeOrange Aero Disc wheels. Red Stripe Graphics on Sides, Hood & Roof. Small White Hot Wheels Logo with "Advan", "GReddy" & "Yokohama" logos on doors. White square on hood with small red Hot Wheels logo & black #96. White "Advan" logo on hood, Grey Malaysia Base, ChromeOrange Aero Disc wheels. Black and Pale Yellow Graphics on Sides which include a #73, "HW-620", "Datsun" and a Small Hot Wheels Logo with Camo on the Lower Side, Black Malaysia Base, Grey Steelie 8 Slot wheels. Blue, Silver & Orange Stripe Graphics on Hood & Sides. Small Silver Hot Wheels Logo on Doors. Small Silver "GReddy" Logo on Rear Fender. Silver & Blue "DATSUN" Emblem on Front Fender. Silver Door Handles. Marker Lights, Chrome Malaysia Base, Black 5SP wheels. Dark Blue, Light Blue & Orange Stripe Graphics on Hood & Sides. Small Dark Blue Hot Wheels Logo on Doors. Small Dark Blue "GReddy" Logo on Rear Fender. Silver "DATSUN" Emblem on Front Fender. Silver Door Handles, Chrome Malaysia Base, Black 5SP wheels. Red, Dark Blue & Blue Graphics with "GReddy", a # 94 and a small Hot Wheels Logo on Sides and Hood, White Malaysia Base, Chrome WSP wheels. Red, grey & black graphics with "GReddy", #94 and a small Hot Wheels logo on sides and hood, Red Malaysia Base, Chrome/Black Steelie 8slot wheels. Red & white graphics with "Advan" & racing logos. "Kaido House" on hood. Red stripes on sides & across top, Red Malaysia Base, ChromeGold/Black MC5 wheels. Black Tampo with "Kaido House" on hood, Light blue striping and white writing on sides, Black Malaysia Base, Black/Grey MC5 wheels. Black Panels on Hood and Cowl. Light Green Pinstriping with "NEO-KAIDO" on Sides. Light Green Logos on left Nose, Grey Malaysia Base, Chrome Steelie 8slot wheels. Black Hood With Hot Wheels Logo, Borla & Greddy On Hood and Green Neon Lines and Neo*kaido On Sides, Black Malaysia Base, ChromeGreen/Black Steelie wheels. Black Taillight Panel with Detailed Taillights. White Rear License Plate with Blue & Red "GReddy" Logo. Silver & Black "FuguZ" Badge on Rear Spoiler, White Malaysia Base, Chrome/Black MC5 wheels. Black front bumper, Black taillight panel with detailed taillights. White rear License Plate with Blue & Red "GReddy" Logo. Silver & Black "FuguZ" Badge on rear Spoiler, Orange Malaysia Base, Chrome/Black MC5 wheels. Red stripes on sides & hood, #24 on sides & hood, Grey Malaysia Base, Grey MC5 wheels. Blue & Gold stripes on sides & hood, #24 on sides, Grey Malaysia Base, Gold/Black MC5 wheels. Red "Fifteen 52" on Doors and Hood. Small Red Hot Wheels Logo on Rear Fenders. Red Racing Stripe on Hood, Roof and Trunk. Red "Fifteen 52" on Trunk, Black Malaysia Base, Red 5SP wheels. Black "Fifteen 52" on doors and hood. Small black Hot Wheels logo on rear fenders. Black stripe on hood, roof and trunk. Black "Fifteen 52" on trunk, Black Malaysia Base, Black 5SP wheels. White number circles on doors & hood. Black racing stripes over hood, roof & trunk. Black "Yokohama" logo twice on hood. Black racing & Hot Wheels logos on sides. Silver door handles, Grey Malaysia Base, Steelie 8 Slot wheels. Blank White Circles on Doors & Hood. Burgundy Racing Stripes over Hood, Roof & Trunk. Burgundy "Yokohama" Logo twice on Hood. Burgundy Racing & Hot Wheels Logos on Sides. Silver Door Handles, Black Malaysia Base, ChromeGold/Black MC5 wheels. Blue Stripe & Panel Graphics on Sides, Hood, Roof & Trunk with a Star on Hood. Black Circle on Doors. Small Red Hot Wheels Logo on Rear Fender. Red Decal on Lower Front Fender, White Malaysia Base, Chrome/Black MC5 wheels. Detailed headlights & taillights. "GTR" on rear license plate, emblems front & rear, Dark Grey Malaysia Base, Chrome PR5 wheels. Headlights, Grille, Emblem, License Plate on Rear with a Small Hot Wheels Logo, Taillights & Vents on Hood & Front Air Dam, Black Malaysia Base, Grey J5 wheels. Hood Vents, Headlights, Marker Lights, Grille, Taillights, Emblems and a Small Hot Wheels Logo on Rear License Plate, Black Malaysia Base, Grey J5 wheels. Black trim stripe on sides. Black vent details on pillars. Detailed taillights & sidemarkers. "DMC" on rear license plate, Black Malaysia Base, Chrome/Black HW Steelie 8-Slot wheels. Yellow & White stripes on sides, Red stars & #10 on sides, Black Malaysia Base, Chrome 5SP wheels. Black Demon logo on front fenders. Detailed taillights with black trim. Silver "Dodge" & "SRT" badging on rear. Black rear spoiler. Detailed sidemarkers, Black 5SP wheels, Dark Grey Malaysia Base. Black, Red & Yellow stripes & graphics on hood & sides. White "Dodge" on hood & doors. Black rectangle with white #316 on doors. Red Hot Wheels logo on bedsides. Various racing logos on sides, ChromeRed 5SP wheels, Black Malaysia Base. White, Black, & Dark Red deco, "Skyjacker Suspensions" & 'Dodge' on sides, Black Malaysia Base, Black/Grey BLOR wheels. Green Stripes & Panels on the Sides & Hood. "Express" & "Firestone" on Sides, Chrome Malaysia Base, Chrome 5SP wheels. Yellow and dark blue stripes on sides. Dark blue "Hella" logo on doors. Yellow "Dodge" & Hot Wheels logo on rear quarters, Blue/Chrome PR5 wheels, Black Malaysia Base. Black & Red Stripes Graphics on Sides, Hood & Trunk. "Dodge" on Rear Fender, Small Black Hot Wheels Logo on Front Fender, White "SRT" on hood, Black Malaysia Base, Dark Grey Y5 wheels. Red yellow & white "MOPAR" logo & graphics on sides. White "Dodge" on rear fender. Red stripes on hood roof & trunk. White "MOPAR" logo on hood with "SRT" twice, Black Malaysia Base, ChromeRed/Black PR5 wheels. Black stripes on sides & hood, Silver Hellcat logo on sides, White 'SRT' on hood, Black Malaysia Base, Black PR5 wheels. Yellow and Silver Stripe Graphics on Sides, Hood and Trunk, "Mooneyes" Logo on Front Fender, a small Yellow Hot Wheels Logo on the Rear Fender. Chrome Malaysia Base, Yellow/Black MC5 wheels. Black & Silver Racing Stripes on Hood & Trunk. Black & Silver Stripes on Sides. Silver "Dodge" on Rear Quarters. Small Black Hot Wheels Logo on Rear Quarters. Black & White "Mooneyes" Logo on Front Fenders. Chrome Malaysia Base, Chrome MC5 wheels. Red stripes on sides & over hood, roof & trunk. Red "Dodge" on trunk. Black "500" twice on hood. Black Hot Wheels logo on rear sides. Orange front sidemarkers, Chrome Malaysia Base, Grey MC5 wheels. Orange, Black, White, & Silver "HEMI 50 Years" logo on sides, White stripe across rear trunk and fenders, Chrome Malaysia Base, Grey 5SP wheels. Orange, Black, White, & Silver "HEMI 50 Years" logo on sides, White stripe across rear trunk and fenders, Chrome Malaysia Base, Chrome 5SP wheels. Red and Blue Stripe Tampos with Red "Hot Wheels", White "Super Chromes", Red and White Hot Wheels Logo, and White "Dodge" on Sides, Chrome Malaysia base, Chrome Red 5SP wheels. Black & White stripes, "Mooneyes" deco on sides. Blue graphics on sides & hood. Red & white #17 & Hot Wheels logo on hood. White, black & red #17 & Hot Wheels logo on doors. White "Falken" logo on hood. Blue & red "Falken" logo on sides, Black Malaysia Base, Chrome Black MC5 wheels. Green graphics on sides & hood. Red & white #17 & Hot Wheels logo on hood. White & red #17 & Hot Wheels logo on doors. White "Falken" logo on hood. White & red "Falken" logo on sides, Black Malaysia Base, Chrome Black MC5 wheels. "Falken Tires" Graphics, a #873, 'Hot Wheels' Logo and various Racing Decals on Sides, White Falken Tires and a Red & White Hot Wheels Logo on Hood. White & red "Falken" logo and #873 on sides, Black Malaysia Base, Chrome BLOR wheels. "Falken Tires" Graphics, and 'Hot Wheels' Logo and various Racing Sponsors on Sides, White Falken Tires and Racing Sponsor Logos on Hood. Blue & Red "Falken" logo on sides, Black Malaysia Base, Chrome MC5 wheels. "Falken Tires" Graphics, and 'Hot Wheels' Logo and various Racing Sponsors on Sides, White Falken Tires and Racing Sponsor Logos on Hood. White & Red "Falken" logo on sides, Black Malaysia Base, Chrome MC5 wheels. "Falken Tires" Graphics with various Racing Decals and Stripe Graphics, Black Malaysia Base, Chrome M5 wheels. "Falken Tires" Graphics with various Racing Decals and Stripe Graphics, Grey Malaysia Base, Chrome/Black MC5 wheels. Light Green, White, Red & Orange tampos, "Falken Tire" deco on sides & hood, "K&N" Filters logo on sides, Grey Malaysia Base, Chrome MC5 wheels. "Falken Tires"' Graphics, and Hot Wheels Logo and various Racing Sponsors on Sides, White Falken Tires and Racing Sponsor Logos on Hood. Blue & Red "Falken" logo on sides, Black Malaysia Base, Chrome MC5 wheels. "Falken Tires" Graphics, and Hot Wheels Logo and various Racing Sponsors on Sides, White Falken Tires and Racing Sponsor Logos on Hood. White & Red "Falken" logo on sides, Black Malaysia Base, Chrome MC5 wheels. Dark Blue, White & Red Graphics on Sides, Hood & Roof which include "500", #04, Stripes & Panels, Various Racing Decals and a small Hot Wheels Logo, Black Malaysia Base, Orange PR5 wheels. Black, White, Red & Gold Graphics on Sides, Hood & Roof which include "500", #03, Stripes & Panels, Various Racing Decals and a small Hot Wheels Logo, Black Malaysia Base, Red PR5 wheels. Black, White, Red, Purple and Yellow Graphics on Sides, Hood and Roof which include "500", #02, Stripes and Panels, various Racing Decals and a small Hot Wheels Logo, Grey Malaysia Base, Lime Green PR5 wheels. Black, white and yellow graphics on sides, hood and roof which include "500", #01, stripes and panels, various racing decals and a small Hot Wheels logo, Black Malaysia Base, Yellow PR5 wheels. White stripes & Yellow checkerboard deco on sides, White stripes on hood & roof, "Polizia" on sides & hood, Black Malaysia Base, White 10SP wheels. tampo'd headlights, FIAT emblem on front & rear, Black Malaysia Base, Chrome Y5 wheels. For Mustang model cars click HERE. For Ford GT model cars click HERE. Silver "Bronco" on sides, tampo'd taillights, Black Interior, Unpainted Malaysia Base, OR RR wheels. Orange & white stripes on hood & sides. White stripes on trunk. Large red, yellow & white Hot Wheels logo on sides. Red & white #10 on sides. White 50th Anniversary Hot Wheels logo on trunk & rear quarters. White "BFGoodrich" & "Bilstein" logos on sides, Orange Malaysia Base, with HW 50th Chrome wheels. Green & Red stripes on sides & hood & trunk, "CASTROL" & #12 on sides and hood, "FORD" oval and HW Flame Logo on sides, White Malaysia Base, Chrome 5SP wheels. Green & White stripes on sides & hood, "CASTROL" & #12 on sides and hood, "FORD" oval and HW Flame Logo on sides, Red Malaysia Base, White 5SP wheels. Blue stripes on sides & hood, White Malaysia Base, Chrome 5SP wheels. White stripes on sides & hood, Blue Malaysia Base, Gold 5SP wheels. White, Grey, & Lt. Blue tampos on sides & hood, "Ford" logo on sides & hood, Black Malaysia Base, White 10-Spoke wheels. Blue & Lt. Blue tampos on sides & hood, "Ford" logo on sides & hood, Black Malaysia Base, Grey 10-Spoke wheels. Red & Black Stripe Graphics with "KONI" on the Sides, Hood & Roof, Black Malaysia Base, RedChrome/Black Y5 wheels. Red & Black Stripes Graphics on Sides, Hood & Roof. Black "Koni" Logos on Sides & Hood. Very Small Red Hot Wheels Logo on Lower Sides. Very Small Blue Ford Logo on Lower Sides, Black Malaysia Base, RedChrome/Black Y5 wheels. detailed headlights, "Ford" logo on front of hood, Black Malaysia Base, Silver PR5 wheels. White racing stripes over hood, roof & trunk, Orange stripe on hood. "Union 76" logo twice on hood, White & Orange stripes on sides, Blue #76 in Orange circle on doors, White "Get the Spirit" on rear sides, Blue 'Ford' logo on sides, White Hot Wheels logo on front fender & trunk, Chrome Malaysia Base, Chrome 5SP wheels. Blue racing stripes over hood, roof & trunk, Orange stripe on hood. "Union 76" logo twice on hood, Blue & Orange stripes on sides, Blue #76 in Orange circle on doors, Blue "Get the Spirit" on rear sides, Blue 'Ford' logo on sides, Blue Hot Wheels logo on front fender & trunk, Chrome Malaysia Base, Grey 5SP wheels. Silver and Yellow Green Flames on Front and Rear Fenders, Doors and Hood. Small Hot Wheels Logo on Door, Chrome Malaysia Base, Chrome/Black Steelie 8 Slot wheels. Brown, Blue & White Rust Patina & Graphics on Sides with "Hot Wheels Hot Trucks" on Sides, Brown Malaysia Base, White Steelie 8 Slot wheels. Brown Rust Patina & Graphics on Sides with "Hot Wheels Hot Trucks" on Sides, Black Malaysia Base, Chrome 5SP wheels. Brown, Black & White Rust Patina & Graphics on Sides with "Hot Wheels Hot Trucks" on Sides, Brown Malaysia Base, Chrome/Black Steelie 8 Slot wheels. White racing stripes on the top & sides, White Hot Wheels logo on rocker panels. "Camaro" badge on front fenders, Black Malaysia Base, Chrome-Black-Red MC5 wheels. White roof & 2 white racing stripes on hood. Large black "Forza Motorsport" logo on roof. White "Forza Motorsport" logo on sides. White & black square with "Xbox One" logo & #01 on doors. White & black "GB" oval sticker on rear. Silver "Mini Cooper" badge on rear. Detailed headlights, taillights & handles. Wide black stripe on hood with silver outline. Black rockers with silver pinstripe. Black "Forza Motorsport" logo on rear quarters. Grey door handles. Detailed grille, headlights, taillights & sidemarkers. Red & blue stripes on sides. Red, blue & dark blue stripes on hood & trunk. Red "Forza Motorsport" logo on hood. Various racing logos on sides. BMW Roundel on hood & rear. "Turbo" & "2002" mirrored on front bumper. "Turbo" on rear with "BMW" on rear plate. Detailed grille, headlights & taillights. White Forza "FM" logo on hood. Multiple dark blue Forza "FM" logos down sides. White "Forza Motorsport" & "Xbox One" logos on sides. White & red "Spec-R" badge on sides. Silvia "S" badge on nose. Silver "Nissan" & "Silvia" badges on rear. Detailed headlights, taillights & sidemarkers. Forza "FM" logo on doors & roof. "Forza Motorsport" & racing logos on hood & sides. Detailed headlights, taillights & badging. Forza Motorsport "F" logo on doors & hood. "Bell" logo on front fenders. "Forza Motorsport" logo on rear fenders. Silver trim on hood, sides & rear engine cover. Silver door handles. Detailed headlights & taillights. Red, blue, dark blue & black graphics on hood & sides. Two red opposing Forza "F" logos on hood. Red Forza "F" logo on doors. Red windshield banner. "Forza Motorsport" & racing logos on sides. Detailed headlights & taillight. Red hood and roof. Porsche badge on hood. Detailed headlights and taillights. Red stripe along rockers with "GT3 RS." White Forza "F" logo on doors. White "Forza Motorsport" logo on rear wing. Blue roof and rear of car. Orange graphics on hood and doors. Detailed headlights. Ford Blue Oval logos on nose & sides. "XBox One" logos on front. "Forza Motorsports" logos on doors. White stripe and "Ford Performance" on roof. Flat black roof. Black stripes on nose & sides. Black headlight trim. Black "Forza Motorsport" & "F" logo on sides. "XBox One" logo on sides. Silver "Pagani" & "Huayra" on rear. with black "FM" & blue "FORD" logo on doors, blue "FORD" logo on hood & white"XBOX" logo on doors. with black "FM" logo on doors & green "XBOX" logo on hood. with silver "FM" logo on doors & silver "XBOX" logo on hood. with black "FM" logo on roof & black "XBOX" on rear hatch. with black "FM" logo on roof & black "XBOX" logo on hood. with black "FM" logo on doors & white "XBOX" logo on rear quarter panel. with white "FM" & "XBOX" logo on hood & roof & doors. with black "FM" logo on doors. with #16 and "FM" logo on doors. with #01 and white "FM" logo on doors. Red & blue stripes on sides with black #5 on doors. Small Hot Wheels logo and Honda badge on sides. White "Turbo" on sides. Red & Dark Blue stripes on hood. Red rear spoiler, Black Malaysia Base, Chrome AeroDisc wheels. Red & Blue stripes on sides. Black #4 on doors. White "Turbo" on rear quarters. Kaido House & Yokohama logos on sides. White "Honda" windsield banner. White Hot Wheels logo on roof, Grey Malaysia Base, Black PR5 wheels. Silver, Gold & Black Stripes, Black Malaysia Base, ChromeBlack PR5 wheels. Black Stripe Graphics on Sides. Small Black Hot Wheels Logo on Lower Side. Taillights, Black Malaysia Base, ChromeBlack PR5 wheels. Silver Acura emblem on front, Black stripe on wing, tampo'd taillights, Black Malaysia Base, Chrome J5 wheels. Red Taillights with a Black & White License Plate with a Small Hot Wheels Logo on the Rear, Black Malaysia Base, Chrome 5SP wheels. "Boost Brigad"' in White on Sides, Hood & Rear Spoiler. Skull Graphic on Roof. Shades of Grey Camo Graphics on Sides & Hood. Small Hot Wheels Logo on Rear Fender, Grey Malaysia Base, Chrome PR5 wheels. Green splash graphics on sides, hood & edges of roof. Black Hot Wheels logo on rear quarters. Black & silver "Tein" logo & "For Your Driving Pleasure" on doors. Black "Tein" logo on hood. Black on top of rear spoiler, Black Malaysia Base, Chrome J5 wheels. Black Stripe on Nose & Black Circle on Doors. Headlights, Black Malaysia Base, Black Y5 wheels. White stripe across front, White solid circle on sides, Black Malaysia Base, Black Y5 wheels. Jaguar logo on sides, "Jaguar" on front windshield & hood, #22 & Union Jack flag on sides & hood, Black Malaysia Base, Black CM6 wheels. Woodgrain sides, Tan Interior, Unpainted Malaysia Base, OR RR Performance wheels. For Lamborghini model cars click HERE. tampo'd taillights, "PPW 306R" on rear license plate, White Malaysia Base, 5SP wheels. tampo'd taillights, "PPW 306R" on rear license plate, White Malaysia Base, Chrome 5SP wheels. White & Black Graphics of a "VOLK Racing Wheel" Logo and a Small Hot Wheels Logo on Sides, Mazda & "VOLK Racing Wheel" Logo on the Hood, Black Malaysia Base, Grey PR5 wheels. Blue Door. White Stripe on Sides. "Mazda Racing Support Truck 1974" Graphic on Doors with a small Hot Wheels Logo, small Mazda Logo, small NGK Logo. Wear Marks on Sides. MadMike Logo & "Rotang Klan" in White on Tailgate, Chrome Malaysia Base, Blue/Black Steelie 8 Slot wheels. Black hood. Red rear sidemarker lights. Black Japanese writing on doors. Red Hot Wheels and racing logos on doors, Dark Grey Malaysia Base, Grey 10SP wheels. Black & Yellow stripes on sides & hood, "Mazda" & #2 on sides & hood, Black Malaysia Base, Yellow/Black MC5 wheels. Blue & Yellow stripes on sides & hood, 2Mazda" & #2 on sides & hood, Black Malaysia Base, Gold/Black MC5 wheels. For McLaren model cars click HERE. Red, Yellow, Black & White Graphics on Hood & Sides. White & Black Square with #71 & "GT Champion" on Sides & Hood. White "AMG" Logo on Sides & Hood. Red & Yellow Hot Wheels Logo on Sides, Black Malaysia Base, Yellow-Black PR5 wheels. Red, yellow, black & white graphics on hood & sides. White & black square with #71 & "GT Champion" on sides & hood. White "AMG" logo on sides & hood. Red & yellow Hot Wheels logo on sides, Black Malaysia Base, Yellow-Black J5 wheels. tampo'd headlights, taillights & grille. Silver Mercedes logo on hood and trunk with Silver model tags, Dark Grey Malaysia Base, Grey Y5 wheels. Silver HW logo on Black rear wing, Black Malaysia Base, Gold WSP wheels. Blue stripe with white stars on rocker panels. Red, white & black "Wonder Woman" on doors. White fenders. Wonder Woman image on roof. Wonder Woman face image on rear sides. Detailed headlights & taillights, ZAMAC Thailand Base, Chrome RRLW5SP wheels. Fred Rogers character, "Scooby-Doo!" and snowflakes on sides. White feneder flares, white line graphics on roof. Detailed headlights and taillights, ZAMAC Thailand Base, Chrome RR 10SP wheels. Black roof, Black stripes on sides & hood, "FC" emblem on sides & hood, "Campbell's Garage" on sides, Chrome Malaysia Base, Chrome Black MC5 wheels. White roof, White stripes on sides & hood, "FC" emblem on sides & hood, "Campbell's Garage" on sides, Chrome Malaysia Base, Chrome 5SP wheels. Blue, LightBlue & Yellow stipes on sides, Beige, Red & Blue Union Jack on roof, Yellow stripes on hood, Yellow Malaysia Base, White PR5 wheels. Blue, Lt. Blue, & Red stipes on sides, Red & Blue Union Jack on roof, Lt. Blue stripes on hood, Blue Malaysia Base, Chrome PR5 wheels. White and Blue Stripe Graphics with a White Circle, a Small Hot Wheels Logo and Magnus Walker Urban Outlaw Logo on Sides. White Stripe Graphics with Single Star and White Circle on Hood, White & Blue Magnus Walker Urban Outlaw Logo on Roof, Chrome Malaysia Base, Grey WSP wheels. White and Red Stripe Graphics with a White Circle, a Small Hot Wheels Logo and Magnus Walker Urban Outlaw Logo on Sides. White Stripe Graphics with Single Star and White Circle on Hood, Red, White & Blue Magnus Walker Urban Outlaw Logo on Roof, Chrome Malaysia Base, ChromeRed-Black PR5 wheels. Two cyan stripes on hood & roof, purple arrow pattern on roof, snow spray on sides, "HWGRFX" racing sign #333, HW Snow Stormers logo, LWC Racing, Chrome Malaysia Base, Black/White PR5 wheels. Two silver stripes on hood & roof, blue arrow pattern on roof, snow spray on sides, "HWGRFX" racing sign #333, HW Snow Stormers logo, LWC Racing, Chrome Malaysia Base, Black/White PR5 wheels. Black, Light Green, Orange & White brush paint graphics on sides, roof, & front fenders. Large "H" on roof. Partial Hot Wheels logo on sides, Black Malaysia Base, ChromeOrange 5SP wheels. Dark Blue, Magenta, Orange & Yellow Graphics on sides, roof, & front fenders. Large "H" on roof. Partial Hot Wheels logo on sides, Black Malaysia Base, Black 5SP wheels. Yellow & Black #77 on sides, race deco on sides, Union Jack flag on roof, ZAMAC Malaysia Base, Chrome Black MC5 wheels. Taillights, Emblems and small Hot Wheels Logo on Rear, Black Malaysia Base, Chrome J5 wheels. Black & Red stripes on hood & sides. Silver "Trans Am" on front fenders. Silver door handles. Detailed sidemarker lights, Grey Malaysia Base, ChromeRed-Black MC5 wheels. Blue & Silver Firebird emblem on sides & hood, Metal Malaysia Base, Chrome RetroSlot wheels. For Porsche model cars click HERE. Orange & White Stripe & Panel Graphics on Sides, Front Deck Lid & Roof. A #05 on Sides & Front Deck Lid. Small White Hot Wheels Logo on Sides. Red Banner on Windshield with "Renault Sport", Grey Interior, OrangeRed Malaysia Base, Chrome TRAP5 wheels. Black accents on doors & hood. White #01 on sides & black "01" on hood. Black "R.S. 01" & Hot Wheels logo on rocker panels. Black "R.S. 01" on hood cowl. White "Renault Sport" on top of windshield. Red Banner on Windshield with "Renault Sport", Black Interior, Black Malaysia Base, ChromeRed/Black TRAP5 wheels. Black accents on doors & hood. White #01 on sides & black #01 on hood, Black "R.S. 01" & Hot Wheels logo on rocker panels, Black "R.S. 01" on hood cowl, White "Renault Sport" on top of windshield, Red vertical wing stabilizers with white "Renault Sport", Black Interior, Black Malaysia Base, Grey TRAP5 wheels. Matte White with Red stripe and Black rear Wing, Hot Wheels logo & Swiss Flag & Black "Alpine Tour" on sides, Silver & Red stripes on hood & roof, Black Interior, Black Malaysia Base, Chrome Red/Black PR5 wheels. White, Grey & Green stripes on sides, Green & White stripes on hood, Green stripe on roof & trunk, Green Malaysia Base, White/Black PR5 wheels. Orange, Grey & Blue stripes on sides, Blue & Orange stripes on hood, Blue stripe on roof & trunk, Blue Malaysia Base, Chrome-Orange Black PR5 wheels. White stripes across top, Black Interior, Satin Grey Malaysia Base, RR 10SP wheels. Grey stripes across top, Clear Window, Black Malaysia Base, Chrome-Grey CM6 wheels. White stripes across top, White & Black #00 on sides & hood, Tinted Window, Black Malaysia Base, White CM6 wheels. Black, white & metallic light blue graphics on sides & hood. "Gravel Rally Crew" on sides & hood. Hot Wheels logo & #368 on sides & hood, Dark Grey Malaysia Base, GoldChrome J5 wheels. Yellow, Orange & White stripes on sides & hood, #22 & race deco on sides & hood, Chrome Malaysia Base, Gold 5SP wheels. Red and White "Tesla Energy" on sides. Detailed taillights. White "Tesla" and Tesla badge on rear panel. Small White Hot Wheels logo on rear license plate, Black Malaysia Base, Chrome 10SP wheels. Red & black "Tesla Energy" on sides. Detailed taillights. Black "Tesla" & Tesla badge on rear panel. Small black Hot Wheels logo on rear license plate, Black Malaysia Base, Grey 10SP wheels. Silver and Black stripe Graphics, Black Malaysia Base, ChromeTrapezoid wheels. Detailed Headlights & Taillights, Tesla Logo on Front & Rear, 'Tesla' on Rear, Grey Malaysia Base, Chrome PR5 wheels. Detailed headlights & taillights. Black grille. Silver trim on trunk with "Tesla" & "Model S" badges and Tesla logo. Red Hot Wheels logo on rear license plate, Black Malaysia Base, ChromeRed/Black PR5 wheels. Black roof, rear view mirros on left and right, tampo'd headlights & taillights, Red HW logo on rear, Black Malaysia Base, Chrome/Black PR5 wheels. Black roof, rear view mirros on left and right, tampo'd headlights & taillights, Red HW logo on rear, Black Malaysia Base, ChromeRed/Black PR5 wheels. Black, blue, light blue & white stripes on sides. White "GReddy" logo on doors. White Hot Wheels logo on sides, Grey Y5 wheels, Black Malaysia Base. For Volkswagen model cars click HERE. For Viper model cars click HERE. Gold 50th Anniversary logo on doors. Gold & blue stripes on sides, Goldenrod Malaysia Base with Gold/Black Steelie 8 Slot wheels. Gold 50th Anniversary logo on hood. Gold & blue stripes over hood & roof, Black Malaysia Base with Gold OH5SP wheels. Gold 50th Anniversary logo on doors. Gold & blue stripes on sides, Goldenrod Malaysia Base with Gold 5SP wheels. Gold 50th Anniversary logo on doors. Gold and blue stripes on sides. Gold 'Dodge' on rear quarters, Gold Malaysia Base with Gold PR5 wheels. Gold 50th Anniversary logo on doors. Gold & blue stripes on sides, Gold Malaysia Base with Gold WSP wheels. 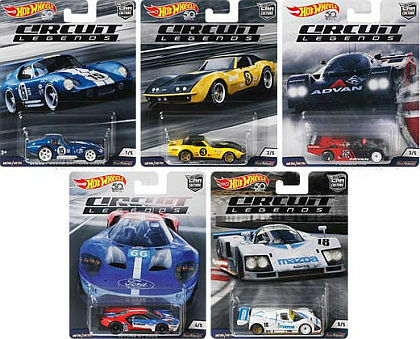 For Gulf Oil model cars click HERE. White & Blue Stripes, "World's Highest Lighthouse" Graphics, Grey Interior with Roll Cage, Black Malaysia Base, White 10SP wheels. Blue, White, Red stripes, Hot Wheels logo & Swiss Flag & Blue "Ski Oberalp" on sides, White, Blue & Red stripes on hood, Black Interior, Chrome Malaysia Base, Chrome/Black FTE2 wheels. Super Mario World graphics, Metal Thailand Base with WW Real Rider wheels. Super Mario Bros. graphics, Metal Thailand Base with Real Rider 5-Spoke wheels. Super Mario Kart graphics, Metal Thailand Base with Real Rider Chrome 5-Slot wheels with Red Line tires. Super Mario Kart graphics, Metal Thailand Base with Real Rider Chrome Mag wheels. standing on a full candy container.